A plastic swatch is a sample piece of square plastic. This sample allows one to understand the look and feel of the plastic in order to determine whether or not it is suitable for a particular use. A sticker affixed to the sample would show manufacturer name and the material code. These swatches are produced by the actual plastic resin manufacturer. In the realm of toy manufacturing they are used by a company such as Kenner as well as it's overseas manufacturing vendors in order to communicate the proper materials to be used on a particular toy. 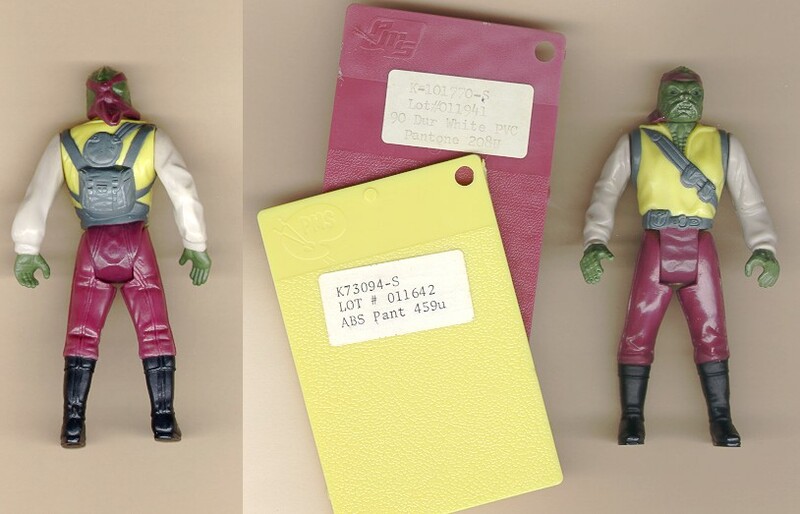 Since something like an action figure could be molded in several color and/or types of plastic, several of these swatches would be required to convey the appropriate information.